The ferry+ touch screen, self service kiosk provides passengers with a convenient easy to use ticketing facility which is especially useful in crowded and busy departure terminals. Kiosks can also be located in tourist offices and shopping malls etc. 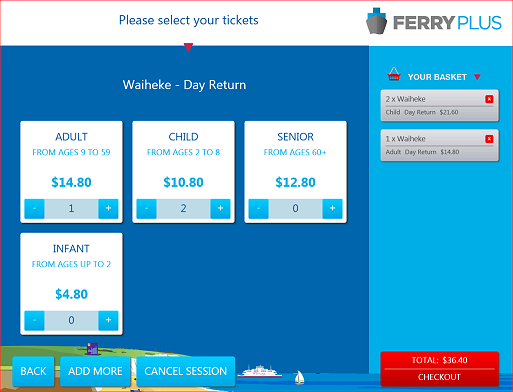 The kiosk can operate either as a stand alone ticketing system or can be fully integrated with ferry+ to check availability and yield class space. Kiosks can also be located in tourist offices and shopping malls etc. The user interface can either be completely tailored to the ferry operators corporate style or delivered with just the operators logo and our generic design. The kiosk can also incorporate an ‘attract loop’ running on the screen when the kiosk is not directly serving a passenger.